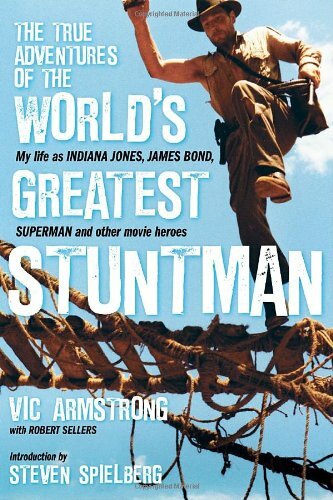 BOOK REVIEW #3: "VIC ARMSTRONG'S THE TRUE ADVENTURES OF THE WORLD'S GREATEST STUNTMAN"
Vic Armstrong can attest to the fact that he is Indiana Jones, Superman and James Bond all rolled into one. The veteran Brit stuntman with more than 30 years of experience under his belt finally launched his first memoir entitled “The True Adventures of the World’s Greatest Stuntman: My Life As Indiana Jones, James Bond, Superman and other Movie Heroes”. Although not a tell-all book about the dirty laundry behind show business, Armstrong provides enough little-known, interesting bits liked how the famous comical scene where Indiana Jones shoots a hulking great Arab in “Raiders of the Lost Ark” was conceived and standing in as Han Solo in “Return of the Jedi”. Of course, since this is a book written by a stuntman, there is ample information on how a certain complex stunt is planned and executed for example the car chase on a ice lake in “Die Another Day”. Our master of this hair-raising craft who is trained from the old school of stunts noticeably voices his opinion on studios’ over reliance of CG as well and though he never state the true reason behind his absence from the fourth instalment of the Indiana Jones franchise, a clever movie fan will sniff out his detachment from the project despite his heavy involvement in the earlier three. Armstrong wastes no time heaping praises on superstars such as Tom Cruise, Cameron Diaz, Will Smith and Angelina Jolie, people who are keen to perform their own stunts on the big screen. He even let out a fact that he has clashed with the late Christopher Reeve over the matter. Reeve being a professional has insists on performing a difficult action scene himself but Armstrong went ahead standing-in for the actor anyway. Currently serving as a second unit director and stunt coordinator on movies such as Mission Impossible 3, The Green Hornet, Thor and The Amazing Spider-Man and having his close family members as stuntmen at his stunt outfit, “Armstrong Action”, Armstrong also talks about his natural career progression and the creative side of working with directors such as Martin Scorsese who has never worked with a second unit prior to “Gangs of New York”, funny stuff that happened working with Paul Verhoeven and a very collaborative Steven Spielberg. While the man has leapt from a horse to a tank, did a 100 feet fall and worked with the biggest names in the industry among the many things he accomplished in his career, he remained steadfast, humble and humorous in his recollection of his achievements. This is a fascinating read for all contemporary movie fans that you will instantly find it hard to put down for a second.